They Might Be Giants released their 20th album, I Like Fun, in January. The two-time Grammy-winning group from Brooklyn established its clever approach to rock ‘n’ roll long ago, as showcased on hits like “Istanbul (Not Constantinople),” “Boss of Me” (the theme from the TV series Malcolm in the Middle) and a highly popular sideline of kids’ music albums. I Like Fun continues TMBG’s more than 30-year streak of making witty music that rocks. 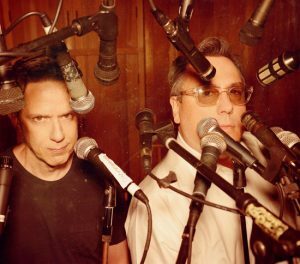 The group’s prime movers and songwriters, John Flansburgh and John Linnell have long been ahead of the curve when it comes to getting their music into the hands and ears of fans. In 1985 they began their long-running Dial-a-Song project, recording tunes onto their answering machines and then inviting fans to call in to listen. The group’s 2016 album Phone Power was culled from those tunes, and for that release TMBG used a pay-what-you-want model similar to the approach Radiohead used on its 2007 album In Rainbows. Flansburgh describes both Dial-a-Song and Phone Power as “based in the idea of giving things to our audience directly. It’s just their reward for putting up with us.” The Dial-a-Song project has gone on hiatus twice, but is scheduled to resume this year. Another initiative designed to reach out more directly to fans was 2004’s Venue Songs project. “Because we’ve been on the road for quite awhile, we often come back to the same places,” Flansburgh explains. “So we thought, ‘Wouldn’t it be interesting to give ourselves the challenge of putting together a short song for every venue we played on that tour?’” A CD+DVD release collected nearly four dozen ditties paying skewed tribute to concert venues from Los Angeles to Glasgow.